Note: This post is by Sara Shipley Hiles, an assistant professor of journalism at the University of Missouri. She is also a freelance journalist and longtime environmental reporter and member of the Society of Environmental Journalists. While at the St. Louis Post-Dispatch, she wrote a series of stories about extensive development of floodplains that were underwater in the Great Flood of 1993. Her academic research looks at media coverage of climate change. While we’re all making New Year’s resolutions about eating less and exercising more, let me suggest something more important we can add to our collective to-do list for 2013. This one’s big. It will take courage. It will take political will and compromise. It will take personal commitment. I’m not talking about gun control, or even the fiscal cliff. I’m talking about facing the climate cliff. Climate change is the biggest long-term threat facing our economy and our society, yet we find plenty of ways to avoid facing it, despite mounting evidence. 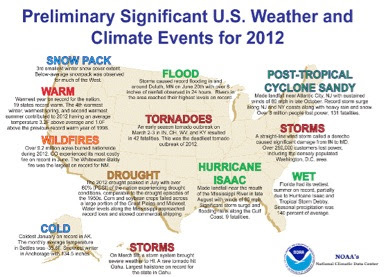 Graphic source: National Climate Data Center's State of the Climate 2012 report. Click graphic to expand. 2012 was the hottest year on record for Missouri and 18 other states, and the continental United States as a whole, according to a recent report from the National Climatic Data Center. 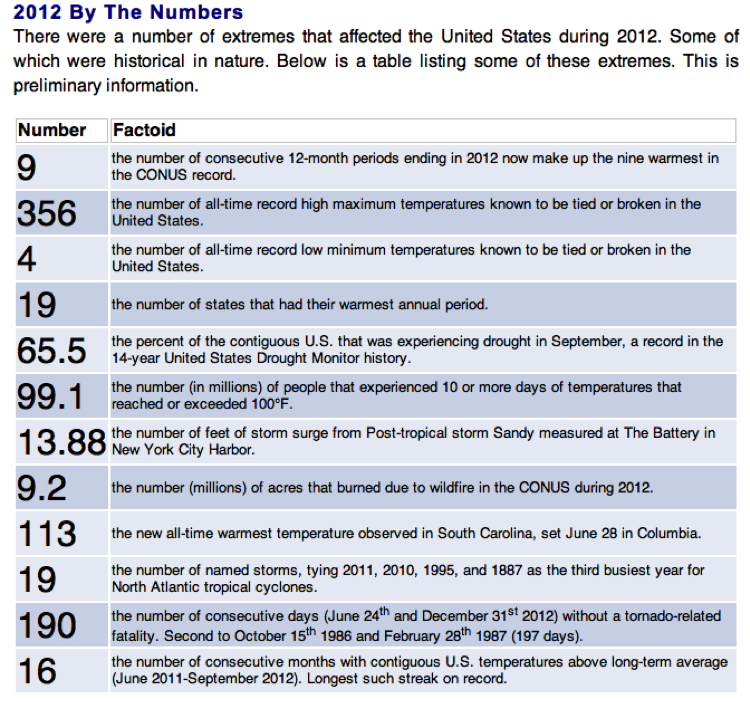 The ninth straight year of record-breaking heat was also an historic year for extreme weather, from severe drought to super-storm Sandy. Yet what dominates the news cycle? Not climate change. An annual analysis of climate change coverage conducted by The Daily Climate, a nonprofit journalism site, found the number of stories on climate change dropped 2 percent last year, the third year of decline. Media Matters, a progressive media research center, found that climate change coverage on network TV remained low last year, despite the weather extremes. The report singled out Sunday shows for spending just 8 minutes on climate change, down from more than an hour in 2009, and not quoting a single scientist on climate change in four years. I don’t blame my fellow environmental journalists, many of whom have fallen victim to newsroom cuts. We are pushing hard to cover what we see as the Story of the Century. And some publications have actually increased climate coverage, but even they can fall prey to industry pressures. News broke today that The New York Times, which far outpaced four other national papers with its climate reporting last year, will dismantle its environment desk. This is particularly disappointing. The Times managing editor for news Dean Baquet told InsideClimate News the move wouldn’t change the newspaper’s commitment to covering the environment or climate change. The World Bank released a report warning that the world must take steps to avoid warming 4 degrees, as is predicted by the end of the century without radical policy change. The report threatened devastating consequences, including the inundation of coastal cities, higher rates of starvation, increased water scarcity and more high-intensity tropical storms. 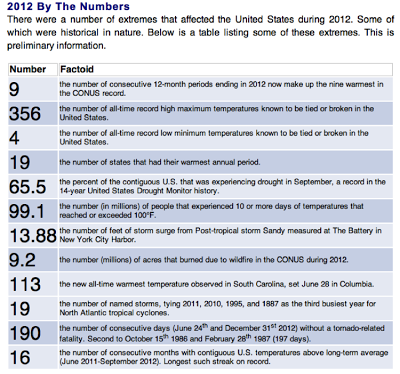 Graphic source: National Climatic Data Center's State of the Climate 2012 report. If these events come to pass, we will be very sorry we didn’t address climate change when we had the chance. So let’s do something that’s good for us this year. Eat more kale, and don’t be afraid to talk about climate change.